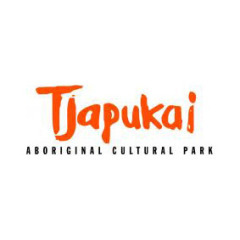 Founded more than 25 years ago, Tjapukai is Australia’s largest Indigenous cultural park and is in the Guinness Book of Records as Australia’s longest running stage show. 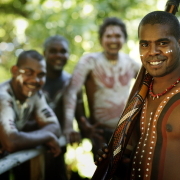 The Cultural Park has been built on traditional Tjapukai land in a beautiful rainforest setting to highlight the environment enjoyed by the Indigenous people of the Cairns Wet Tropics rainforest. Born in the basement of a shopping centre in Kuranda in 1987, Don and Judy Freeman, international theatre artists along with partners David and Cindy Hudson and 5 local Tjapukai men created the first Aboriginal dance theatre. 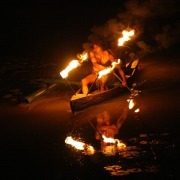 They produced a one hour play that harnessed the spirit of the “BAMA” and presented it with love, humour and compassion. The partnership of black and white like minded people was successful in showcasing this culture to a global audience over a period of 25 years and to more than 3,000,000 visitors. Since commencing operations, Tjapukai has injected in excess of $35 million to the local Aboriginal community in wages, royalties and through the purchase and commissioning of art and artifacts. Tjapukai has won more than 200 awards and today, after 25 years of operations is recognised as the national ambassador for Australia’s Aboriginal cultural tourism. 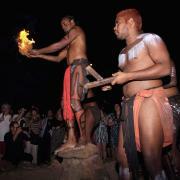 Join the traditional people of this land, the Tjapukai, for an evening of cultural exploration and experience.